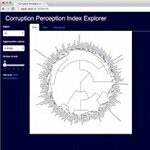 Evolving set of pedagogical applications in Shiny and R.
Corruption Perception Index Explorer with hierarchical clusters. Beer recommender using item-based collaborative filters. Multi-periodicity time-series and periodogram application. Copyright ©2015 Aleph Technologies SPRL. All rights reserved.